When David Hare’s The Judas Kiss was first staged in 1998 with Liam Neeson as Oscar Wilde and Richard Eyre in the director’s chair, the play was, despite all those big names, critically panned. Fourteen years later Neil Armfield bravely resurrected the play for The Hampstead Theatre and the reaction could not have been more different. With Rupert Everett stepping into Oscar Wilde’s fur coat – which fits his broad shoulders perfectly – and under Armfield’s direction, Hare’s play about two pivotal moments in the Irish playwright and poet’s life was given the kiss of life. It was so embraced by critics and audiences alike that it made the “you’ve-made-it-leap” to the West End. 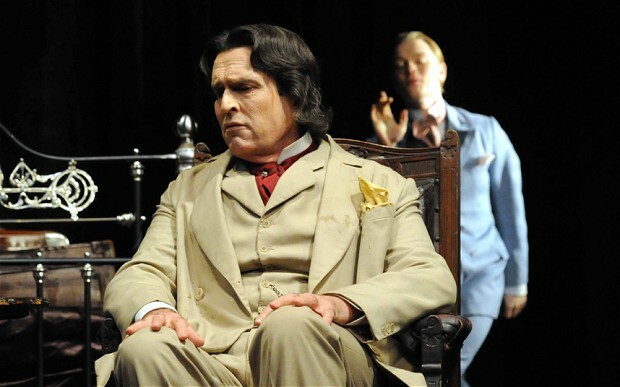 Now in its final few weeks, The Judas Kiss has proved many things, not least that there’s far more to Rupert Everett than a being the amusing scourge of Hollywood. Naturally The Judas Kiss, while poignant, is funny, although Hare avoids the temptation of having a script littered with non-sequitur Wilde-ion bon mots. His script is heavy on words and low of actions, just as Oscar would have it (“As you know I have always disdained unnecessary motion,” he remarks in Act II when refusing to answer the door). The play opens at the Cadogan Hotel where we are immediately introduced to the charms of the chambermaid and servant Arthur who are more concerned with warming rather than making Wilde’s bed. Nakedness is a recurring theme; in the second half it is one actor’s entire role as Bosie’s Italian fisherman conquest to parade around the stage starkers for much of the duration. He is Oscar worthy in the part. But back to the Cadogan where Arthur and the chambermaid are now fully clothed and Wilde is guzzling white wine while his friends argue about his future. Wilde has just been tried and found guilty of homosexual acts and will shortly be arrested. He must choose to flee (as his one time lover, who has now taken on the thankless role of sensible friend, Robbie Ross played brilliantly by Cal MacAninch, urges) or to stay and face jail. Wilde’s achilles heel (or, indeed Judas) Lord Alfred Douglas insists he stays; his reasons aren’t entirely, if at all, romantic. Freddie Fox is a frantic Bosie who captures Lord Doulgas’s shallowness and charm with a dose of self-saving menace. There’s little to like about Bosie, but Fox bedazzles us, along with Wilde, with fine words and a floppy blonde fringe. He almost hypnotised me into believing he’s doing the right thing as he finally flounces out of Wilde’s life with a nasty sting at the end of the second act. The second half moves forward two years where Wilde, fresh out of Reading gaol, sits in a chair in a squalid hotel room in Naples reeling off his pearls of wisdom and eyeing up the aforementioned Italian (Tom Colley). But his new found freedom is tainted when the lover who he risked everything for betrays him for the sake of his inheritance, claiming that he was, and never had been,“an invert”, dismissing his and Wilde’s relationship in one wretched denouement. Wilde is left to lament the nature of betrayal, arguing to an empty stage that if the Bible were more realistic then Jesus would have been sold down the river not by Judas, a man he barely knew, but by his bezzie, John. It’s easy to see Oscar Wilde as we see him now, through modern eyes. Hare’s play might not be telling us anything new about this man whose legend is as famous as his works, but whose public brilliance hid much personal pain. This entry was tagged Freddie Fox, Judas Kiss, Oscar Wilde, Rupert Everett, The Duke of York, Theatre, theatre review. Bookmark the permalink.